In the bowl of a stand mixer, combine flours, brown sugar, sugar, baking soda, baking powder, salt, cinnamon and nutmeg. In a separate medium bowl, combine vanilla, bananas, oil, maple syrup and water. Pour wet ingredients into dry ingredients and mix until well combined. Pour batter into a lightly greased 8 x 4-inch loaf pan. Bake for about 1 hour, or until a toothpick inserted in the center comes out clean. Wait at least 15 minutes to remove bread from loaf pan. Allow to cool completely on a cooling rack before slicing or serving. I’ll be honest – I have no idea what this bread tastes like. But it certainly looks and smells delicious! Those who know me well know that I’m very allergic to bananas – as well as cantaloupe, honeydew melon, kiwi, mangoes, nectarines and a slew of other fruits, environmental critters and things. It’s become sort of a running joke, my banana allergy – every year for Valentine’s Day, one of my friends gives me a bag of banana-flavored taffy candy as a gift. I’ve gotten more cards with bananas on them than I can count, as well as plenty of jokes that bananas are my kryptonite. I don’t mind it at all – I mean, how many people do you know who are allergic to bananas? It is a little odd. That said, I don’t normally wish I could eat bananas, but when it comes to banana bread – especially a dairy-free, egg-free, “healthified” and flavorful one like this Vegan Vanilla Maple Banana Bread – well, I get pretty jealous of all those banana eaters out there. 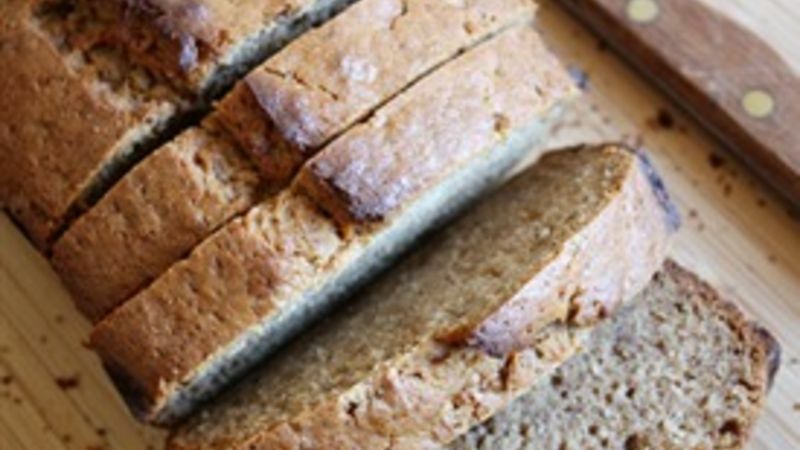 This bread is moist by default because of the ripe, mushy bananas inside, but with the addition of vanilla and maple syrup, the moistness factor is tripled. It’s a little darker than most banana breads due to the maple syrup, which gave this loaf a syrupy, ever-so-slightly crunchy crust. Also, the combination of syrup, vanilla, cinnamon, nutmeg and sugar makes this banana bread indulgent, even in the absence of dairy and eggs. If you’re a nut for nuts, add a 1/2 cup of walnuts to the batter. You can also toss in a large handful of chocolate chips (though this no longer makes it vegan, in some cases). Or, make it plain as I did. My husband says it’s delicious, but he might be a little biased – so I’d love to know what you think of it!